Mtn is really surprising us everytime with new data + offers. If i must say, i don't really know why Mtn is doing this. Recently, they launched 2 new data plans which i posted here on this blog Entclass.com, you can read more about the new data plans here. And now, Mtn has surprised us with another tripping offer which i think is cool to go for if not for anything but for the Airtime that is accompanied with the data. (who no like awoof?). First and foremost, you need to migrate to Mtn TrueTalk by dailing *400#. Skip this if you are already on the Tariff plan. Now, sms D2000 to 131. You will be credited with 5GB of data and 2560naira of airtime valid for 30days. Isn't this cool? Remember you can also get N1950 free airtime accompanied with 100MB of data with just N500. 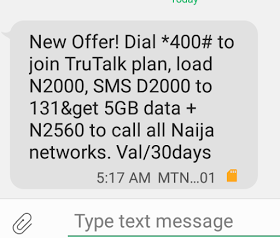 Make sure you’re already on MTN TrueTalk plan, recharge your Mtn line with N500 and SMS V500 to 131 and you’ll be credited with 100mb of data and 1950naira of airtime, valid for 7days. What do you guys have to say about these offers from Mtn?